Kickstart 2.0 brought with it a huge number of changes, and as a result, some software that made certain assumptions no longer worked as expected. The size of the ROM doubled, from 256K to 512K, as more was added to the ROM. 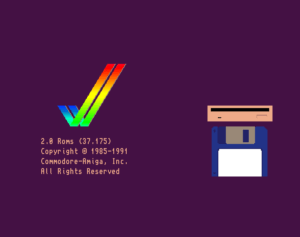 The first thing that most people would notice was the ‘insert disk’ screen shown when the machine was turned on was no longer a static image of a hand holding a disk, but instead showed a beautiful Amiga rainbow tick on the left, with the ROM information and copyright below it, and to the right, an animated display of a floppy disk being inserted into a disk drive. The AmigaDOS module of Kickstart was entirely re-written in C and 68000 assembly language, instead of BCPL, which it had previously been written in. It had been written in BCPL when it was ported to the Amiga from TRIPOS, which had caused many issues for programmers working with other languages. BCPL does not use native pointers, so the more advanced functionality of the operating system was difficult to use and error-prone. 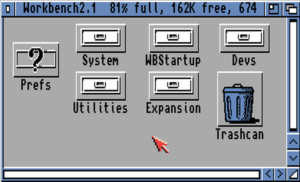 It also incorporated parts of the third-party AmigaDOS Resource Project, a project begun by Amiga developer Charlie Heath, which had already written replacements for many of the BCPL utilities and interfaces. This eliminated the interfacing problems in applications by automatically performing conversions from native pointers (such as those used by C or assembler) to BCPL equivalents and vice versa for all AmigaDOS functions. As the number of different Amiga models increased, so did the number of various versions of Kickstart 2.0 for the models supported, in order to support the various features of the Amiga models it came for. The aim of The Amiga Museum is to delve into the things that were common across all releases of a particular Kickstart version, rather than going into specific differences between say 37.175 and 37.350. However, it is vital that the correct release is matched with the hardware it is to run on. 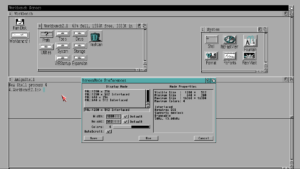 So while it may be possible to simply swap Kickstart chips between some models – for example, a Kickstart 2.0 ROM chip from an Amiga 600 will swap with a Kickstart 2.0 ROM from Amiga 500 plus, but if you put a Amiga 500 Plus Kickstart 2.0 ROM in an Amiga 600, the IDE hard disk drive and PCMCIA port will not work, as there is no support in the ROM for these features of the Amiga 600. Thus if you do change the Kickstart ROM, you must ensure the replacement is the correct one for your particular model Amiga. As a result of the increase of size, this was the first version of Kickstart that was not made available to users of the Amiga 1000, as it no longer could fit into the 256K of space allocated for Kickstart on that machine. But, just like on the Amiga 1000, the very early versions of Kickstart 2.0 were stored on disk for the brand new Amiga 3000, which was the first machine to have the new Kickstart, and it wasn’t yet considered finished when the machine was released. But that was FAR from the only change. Some of the more eagle-eyed amongst you may have noticed something different compared to the text you saw when using machines using the various versions of Kickstart 1.x. The default font (called Topaz) was redesigned. This was the first sign that Kickstart 2.0 was more than an update to the initial screen shown. 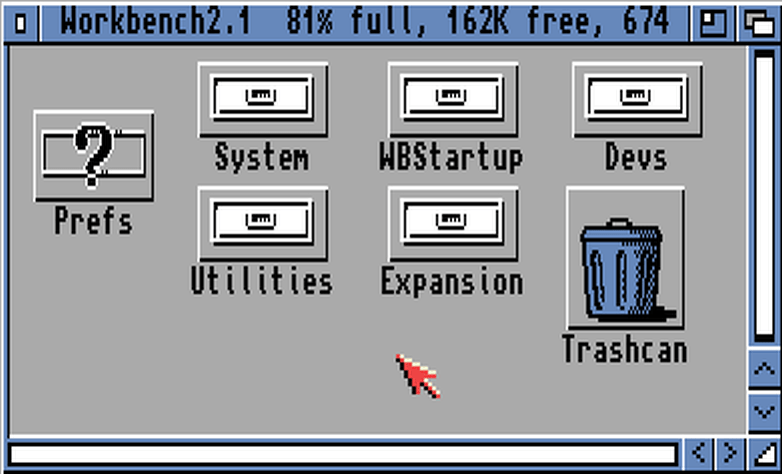 Once Workbench was loaded, a lot more changes were visible, which we’ll attempt to cover here. 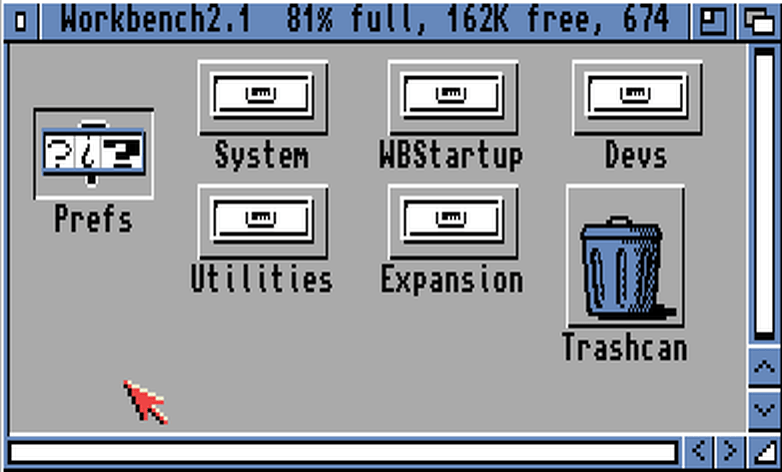 AmigaShell on Kickstart 1.3/Workbench 1.3, showing the default Topaz 8 font. 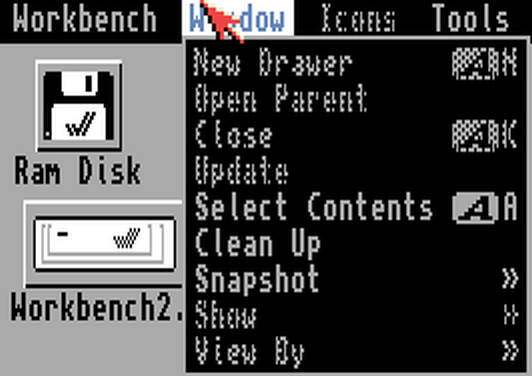 AmigaShell on Kickstart 2.0/Workbench 2.1, showing the default Topaz 8 font. Both images can be clicked on to view in a new tab at double magnification, which should show make it easier to spot the many changes. Now, as mentioned, the default Topaz font, which is stored in the Kickstart ROM has been revised. Have a close look at the Q and A letters for example. 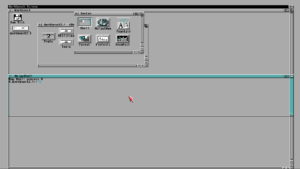 Also, the default colours, both are 4 colour screens, but now we have a pseudo-3D look to the titlebar and gadgets. Blue is no longer the default background colour, replaced by a flat grey, text defaults to black instead of white, and there is no longer any sign of the orange that was so prominent under Kickstart 1.x. Also, the AmigaShell window now has a close gadget up in the top left, which has changed from the gadget used in Kickstart 1.x (more about this below). In the top right, we no longer have 2 gadgets for changing the window depth, instead there is a new gadget to the left of the remaining window depth gadget, which resizes the window to 2 different sizes. The remaining depth gadget now cycles the depth of the window it’s attached to, instead of being a single click item. The first time it is clicked, it brings that window in front of all other windows, then if clicked again, puts it behind all others. Along the right side, there is now a visible border down the right side of the window, from underneath the titlebar depth gadget all the way to the new looking resize gadget. The new pseudo-3D look is partly meant to make the whole system look more “professional”, and to make it easier to use, as gadgets now appear to be raised above everything else, and when pressed, they appear to recess. This is the case on the AmigaShell window above for the close gadget, size cycle gadget, depth gadget and resize gadget. 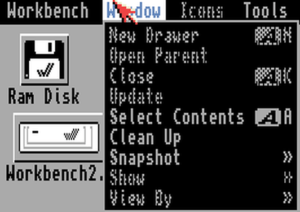 Also visible above is one of the other things taken away, the ‘Fuel gauge’, which can be seen at the left edge of the Workbench 1.3 disk contents windows above, but is not in the Workbench 2.1 disk contents windows. 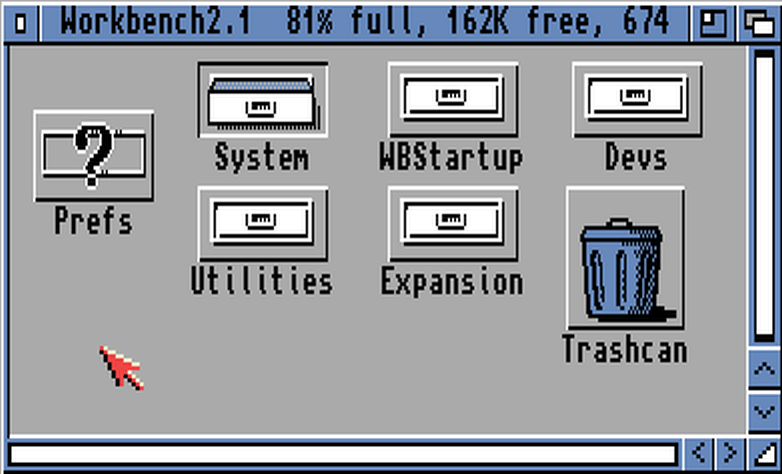 Instead, Workbench now shows a % full in the disk window title, followed by how much space is free, finally showing how much is in use. 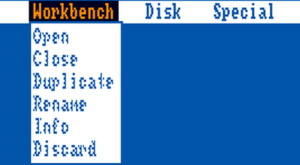 In the Workbench disk content windows above, you can also see the difference for the close gadget in the top left. Under Kickstart 1.x, the close gadget is slightly larger, and is located several pixels to the right of the left window border. Kickstart 2.0 moved the close gadget to be aligned with the left, changed to the pseudo-3D look, and changed the colouring within the gadget. Kickstart 2 also featured a redesign of the menu system. Steps were taken towards making use of the Amiga in higher resolution screens without the text becoming microscopic, by allowing some aspects of windows, menus and various other onscreen text, to use different fonts, larger if the user desired than the standard 8 point Topaz font. While this wasn’t required for most people who used the standard PAL or NTSC screen resolutions of 640×256 or 640×200, the Amiga 3000 with it’s enhanced ECS chipset was the first machine to be available with Kickstart 2, and it was capable of using a 1280×512 screen, literally showing 4 times as much on the same screen, which could quite possibly be a 13 inch (or even smaller) display. 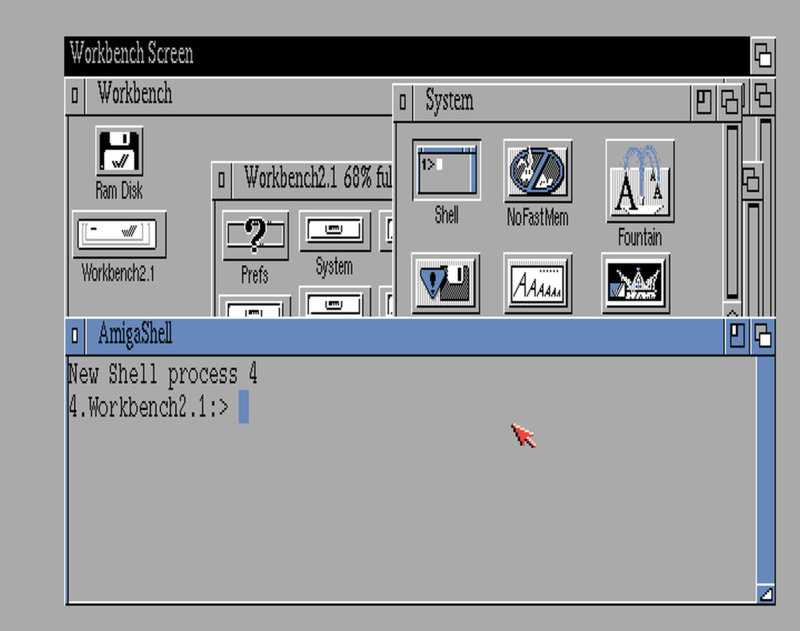 Workbench 2.1 on a standard 640×256 screenmode, with larger fonts selected. 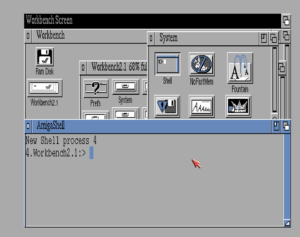 Workbench 2.1 on a standard 1280×512 screenmode, with the standard Topaz 8 font. 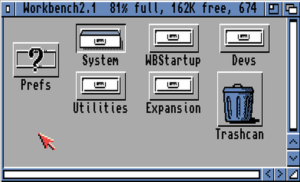 Workbench 2.1 on a 1280×512 screenmode, with size 15 fonts selected. Unfortunately, software tools were free to continue to use the fixed Topaz font, and many continued to do so, including most of the software tools included with Workbench 2.x for changing Preferences, as can be seen above, where the ScreenMode Preferences tool is using the users preferred font for the window titlebar, but all other elements within the window are still displayed in Topaz/8. 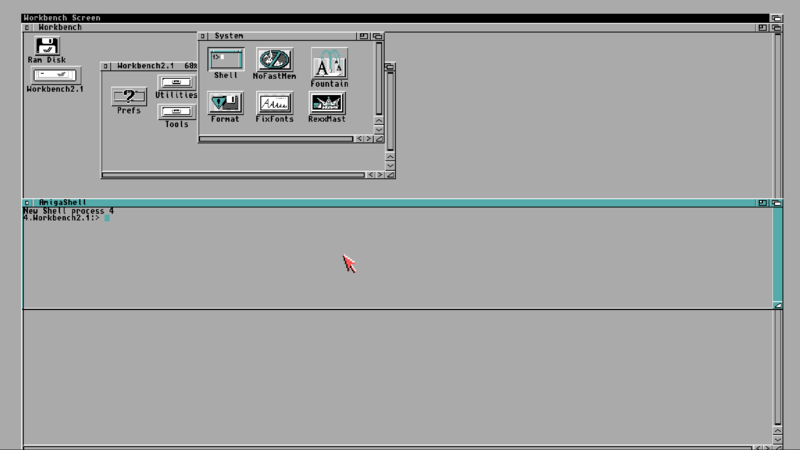 The GadTools GUI toolbox and the BOOPSI object-oriented widget system were also added to the Intuition module of Kickstart, which both provided standard widget sets, and the Amiga User Interface Style Guide, which explained how applications should be laid out for consistency. Kickstart 2 Icon Information, using the new GadTools GUI system. Which version was the correct version for your machine depended on which machine you have. The Amiga 500, Amiga 500 plus, and Amiga 2000 all could use the same ROM. The Amiga 3000, Amiga 3000T and Amiga 600 all required specific versions of Kickstart in order to use the extra hardware that was not contained in the other models – so in the case of the Amiga 600, the IDE and PCMCIA interfaces, in the case of the Amiga 3000 and 3000T, the SCSI interface. 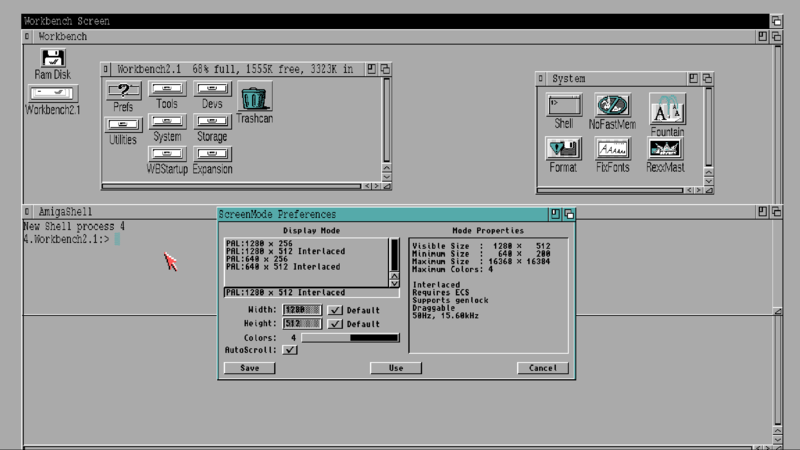 So while you can put an Amiga 500 Kickstart ROM into an Amiga 600, it won’t be able to use the PCMCIA or IDE interfaces. Here’s some information released to developers during the development of “Release 2.0” (the combination name for Kickstart 2.x and Workbench 2.x). Originally it was going to be 1.4 as that was the logical numbering scheme after 1.3, but as more and more changes were made, it was determined that it was enough of a change to be worthy of a new major version number.